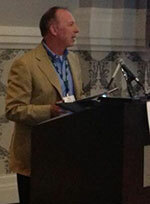 The Turf & Ornamental Communicators Association (TOCA) has named Phil Fogarty, Weed Man sub-master franchisor, its 2013 Environmental Communicator of the Year. Fogarty, who also is owner of Crowley’s Vegetation Management, Cleveland, Ohio, is active in environmental issues through such associations as Project EverGreen and Professional Landcare Network (PLANET). The awards program, which is sponsored by Project EverGreen, has recognized individuals in the Green Industry for outstanding communications efforts regarding environmental issues for 15 years.